The Place Taking over the space of what used to be Guan Dynasty, Duckland is the newest concept by TungLok Group which focuses on casual dining. The restaurant is located on the basement of United Square in Novena, with a casual and contemporary space. Even though the restaurant is called Duckland, the menu is more than just ducks. The Food Irish ingredients are the main highlight at Duckland, where you get Irish ducks on the menu, as well as other dishes like the lamb stew which uses Irish lamb. We started off with a series of duck appetisers like the Tomato-Pineapple Duck Pie (S$6) and Black Pepper Duck Pie (S$6). Both flavours are quite strong, though I would say go for the black pepper. Another addictive snack to order is the Mala Pork Cracklins (S$8). You get bits of mala powder on the crisp and light pork skin, the perfect combination with some beer. The drinks menu has quite a number of alcoholic options as well, including the likes of cocktails and whisky. Go for the Duck Broth (S$5) soup, a hearty tomato base looking soup which is comforting enough for me to take a few more sips. This actually reminds me of the Russian Borscht Soup. My favourite snack from the menu is the Crispy Fried Duck Wing (S$8). 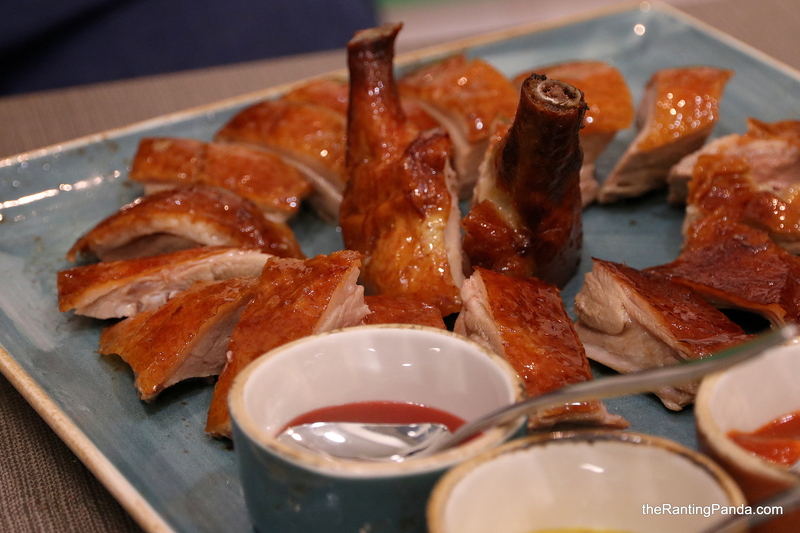 The crispy and deep-fried skin is well-battered, though you don’t get much of the duck meat. Regardless, most of my satisfaction is derived from the crispy duck skin. For mains, a dish which I surprisingly enjoyed is the Irish Stew Lamb (S$22). No gamy lamb taste here, but instead you get a tender lamb meat in a hearty stew. You also couldn’t go very wrong with the Good Ol’ Fish & Chips (S$18). It uses locally sourced barramundi fish, where the flavour is fresh. It has a nice crispy texture for the fish, along with the addictive chips! As you might have noticed by now, the type of cuisine is quite varied here, which is a mix of oriental and western dishes. The Duck Confit & Waffle (S$20) is one of those dishes which will fit well into any cafe, except that this version uses Irish duck no less. The waffle is served along with maple syrup, and the duck confit is quite a decent portion. The duck meat is quite tender here, a dish good to have if you are looking for a mix of sweet and savoury. As for the waffle, the texture is quite soft, so you will be disappointed if you are expecting something more crispy. On to one of the highlights at Duckland, we had the Roast Irish Duck (Half/S$28, Full/S$50). The duck comes in sliced portions, which make it easier for diners to eat. The roast duck is decent, though we find the flavours singular. Despite the fatty skin and juicy meats, the Roast Duck here felt lacking. Not the best rendition of Irish Ducks, unlike those we enjoyed in London. Read our coverage on London’s famous Roast Ducks. For desserts, I tried both the Whisky Cake (S$7) and Apple Crumble (S$7). Go for the Apple crumble, which is served hot fresh from the oven. You get that nice and soft texture within. My only gripe is that it ought to be served along with vanilla ice cream instead of whipped cream. Rants The name of the restaurant can be a misnomer as it is easily misunderstood as a Chinese restaurant or duck specialty restaurant if you didn’t bother to check out its menu. Will I Return Again? For a casual dining option in Novena, Duckland is worth a try. The wide range of options on the menu should appeal to a wider audience, as it is more than just a roast duck specialty restaurant. Make your reservation instantly at Duckland here.